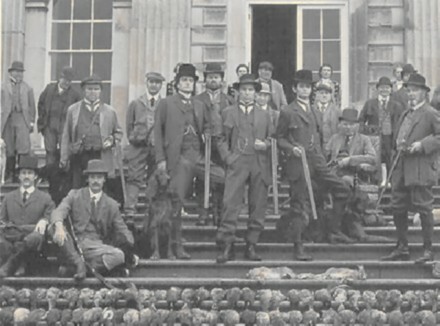 This once popular sport amongst the nobility and gentry of Britain and Europe reached its peak in the early 1920s with gentlemen converging on the stately homes of the North Yorkshire Moors from all around Europe during haggis hunting season. Back in those days, when large haggis herds roamed the Moors in abundance, a hunt would last for several days, with literally dozens of haggis being shot (or hagged in hunting parlance) in just one session. A typical haggis haul (bottom) after a single day's hunting. A typical haggis hunting session would consist of the beaters, or haggillies to give them their correct name, taking their haggis hounds, an all but forgotten breed of specialised hunting dog, onto the Moors and herding the haggis towards the carefully positioned haggis hides. In these hides the hunters would wait patiently until the traditional cry of 'Hag Ho!' went up from the chief hagilly, at which point they would take up their gun positions and attempt to hag as many of the small but elusive creatures as possible as they stampeded past. However, this wholesale slaughter of haggis could not continue without consequence. It was in 1931 on the final weekend of the haggis hunting season that Sir Ralf Liopo of Hunniby Hall*, with his sister Flora Poil, organised what was to prove to be the last ever haggis hunt on the Yorkshire Moors. Amongst his distinguished guests on that fateful hunting party were the Duke of Cumberland, the Laird of Lorne, the Marquis of Andouille and Count Braunschweiger of Austria. 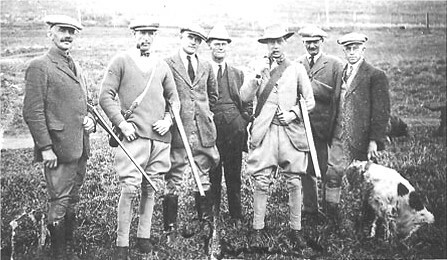 Sir Ralf Liopo (third from right) and guests on the last ever haggis hunt. On the first day, the Friday, not one haggis was hagged, even with the assistance of the highly trained haggis hounds. (In the above photo a haggis hound is held by Alf O'Poril, the famous Irish haggilly). The second day proved a little more successful with a total haul of just eleven haggis, and the third day ended with a mere three haggis. Since this was also the last day of the haggis hunting season that year it can safely be claimed that these were the last ever haggis to be hunted successfully on the North Yorkshire Moors. This is because several weeks later it was discovered that the traditional haggis breeding grounds were all deserted and there were no breeding couples or young to be found anywhere on the Moors. In the intervening years between then and now there have been several unconfirmed sightings of haggis around the Moors, but the sad truth is that the haggis were hunted out of existence on the Moors and are now confined to the Highlands of Scotland. * Hunniby Hall has unfortunately fallen into disrepair since its glory days, but the remains can be visited in the charming North Yorkshire valley of Wintondale. Article by Prof. Aliol of N. Y. University. Not only was I fascinated by your account of the last ever Haggis hunted in GB, but oh, imagine the polyps of joy what sprang into me neck on mention of the Count Braunschweiger, The Wiley Auld Faux, to afford him his full title. You may find it hard, but I was a girl of tender years, believe me. Two husbands and nine beautiful children later, I still feel my eyes swell up with the memory of the summer, pinned beneath his bubbling, port laden gut in the folly neath Arg's Crag. We dined on Boletes and wild raspberries from morning to noon, the Haggis horn our only Haggis horn. Oft times I tease myself and recall.